The Necrotizing Enterocolitis (NEC) Symposium will be held at the Michigan League from June 2 - 5, 2019. This is the story about our Littlest Victors who are hit by one of the most devastating of diseases – one without a prevention strategy, without a cure, and most importantly, without a voice. Like most other medical professionals, I went to medical school because I wanted to help people. To really understand what that means to me though, I’ll have to tell you a bit more about myself. I grew up collecting comic books, hoping to become a superhero, though I never seemed to run into a radioactive spider or be placed in a gamma radiation chamber. As I went through choosing professions, I wanted a career where my job would be to help those who couldn’t defend themselves, in need of urgent help, ones that don’t have a voice of their own. Luckily, I became a pediatric surgeon who spends time in the neonatal and pediatric intensive care units. During my training, as a fellow in Pediatric Surgery at the University of Michigan, I helped care for a family that would eventually become a part of my life. Micah was a twin, born prematurely, and developed necrotizing enterocolitis. The disease progressed and he required surgery to remove intestine that was sick and dying. He recovered but needed IV nutrition and dialysis. He passed away months later due to complications of the disease. Unfortunately, this is an all too common story for many children, with thousands of babies developing NEC each year and hundreds of babies dying. Necrotizing enterocolitis is the most frustrating of conditions with little to predict which babies will be hit by the disease (we lack biomarkers, prediction models, and prevention strategies), and we don’t have a cure. When medically fragile infants, the ones most susceptible to the disease, develop NEC, most parents have never heard of the condition – feeling ill-prepared for the devastating outcomes that may follow. People don’t walk around with a colored ribbon or have walks to support fundraising and awareness. There was no one to speak up for the most fragile of babies – at least until the development of the NEC Society. Micah’s mother, Jennifer, contacted me in 2013, asking about any organizations that exist for NEC. I was not aware of any but was more than willing to help develop one. Through her passion, dedication, and love, she contacted anyone around the country who was invested in research or cared for children with NEC. Along the way, many families reported the same devastating experience with NEC and were more than willing to help raise awareness, provide support, and develop tools for parents and clinicians.  Through the newly formed NEC Society, operated by parents impacted by the disease, we applied for funding from the Patient-Centered Outcomes Research Institute (PCORI), to develop the first national conference around NEC – a symposium that was held in April 2017 at UC Davis. 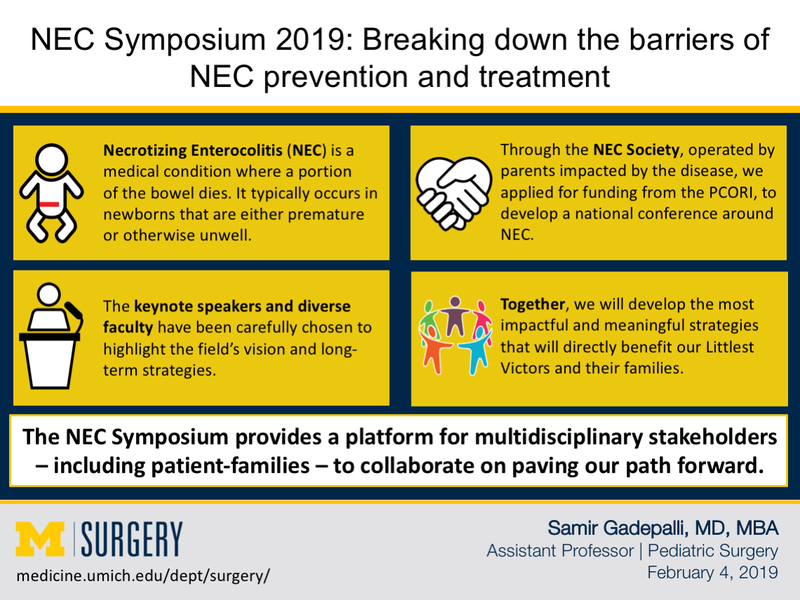 The NEC Symposium 2019 is brought to you by the NEC Society and Michigan Medicine's C.S. Mott Children's Hospital. At the 2017 meeting, clinicians, researchers and patient-families stood side-by-side in lively discussions to express the need for progress. A common vision was established with linking multiple communities around the passion for a prevention and treatment strategy. Though much has been accomplished, barriers still exist which stifle innovation and change. Many of our junior clinicians and researchers struggle to find funding for their research. The field lacks a standardized approach to prevention and treatment. Subsequently, many families affected by NEC feel frustrated, and are eager for increased NEC awareness and research. The NEC Symposium in Ann Arbor will help to break down these barriers. The keynote speakers and diverse faculty have been carefully chosen to highlight the field’s vision and long-term strategies. We are dedicated to improving outcomes for an extraordinarily vulnerable population. The children who are at risk of NEC were born early – too young to breathe, nurse and regulate their body temperature. The NEC Symposium provides a platform for multidisciplinary stakeholders – including patient-families – to collaborate on paving our path forward. Together, we will develop the most impactful and meaningful strategies that will directly benefit our Littlest Victors and their families. I hope you will join me in attending the NEC Symposium.